The La Trobe Society has a range of illustrated talks available for presentation to groups and societies. Charles Joseph La Trobe was Superintendent of the Port Phillip District of New South Wales from 1839 to 1851 and then Lieutenant-Governor of the new Colony of Victoria from 1851 to 1854. 'He was a man of a thousand occupations; a botanist, a geologist, a hunter of beetles and butterflies, a musical amateur, a sketcher of no mean pretensions, in short, a complete virtuoso', Washington Irving, 1835. Dianne was the La Trobe Librarian at the State Library of Victoria until 2008, and Manager of the State Library of Victoria Foundation's Redmond Barry Society until 2014. She is an Honorary Fellow of the School of Historical and Philosophical Studies at the University of Melbourne. Dianne has published extensively on La Trobe, was Co-founder of the La Trobe Society and is the Society's Secretary. Contact Dianne for information and booking. Most Victorians are unaware that our first Lieutenant-Governor, Charles Joseph La Trobe, developed a beautiful garden around his 12½ acre Jolimont estate during the nearly 15 years he spent in Victoria. This talk takes you on a tour of the garden using detailed drawings by Edward La Trobe Bateman completed in 1853. The drawings, plotted on an 1853 map of the estate, and extracts from letters La Trobe wrote to his daughter describing his house and garden give a flavour of the little every-day matters of life at Jolimont in its hey-day. Helen carried out research into garden history for the National Trust and the Australian Garden History Society, and was a researcher and contributor to The Oxford Companion to Australian Gardens. 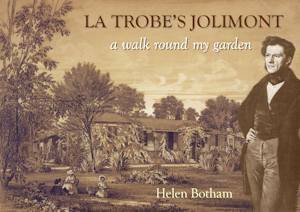 Being a member of the La Trobe Society and founding Chair of the Friends of La Trobe's Cottage, she has a particular interest in the garden La Trobe created at Jolimont. Contact Helen for information and booking. 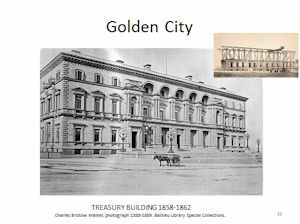 In the 1850s, Melbourne was transformed from a pastoral town to a booming gold rush city in a dramatically short time. This illustrated talk tells the stories of the people who came and the city they built. Charles Joseph La Trobe, as Superintendent and then Lieutenant-Governor until 1854, oversaw Melbourne during this extraordinary period. Loreen Chambers is a retired secondary teacher who taught History, English and Geography during a career of over 30 years. She taught at Scotch College and Camberwell Girls Grammar, but chiefly at Lauriston Girls School where she was Head of History, amongst other senior roles. Her main interests are British and Australian History, with particular focus on the 18th and 19th century period, as well as family history. Contact Loreen for information and booking. 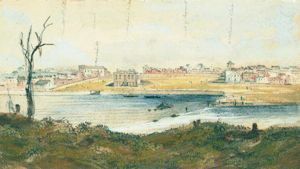 This talk explores the reasons for a settlement being established on the banks of the Yarra River in 1835 and the subsequent development of the rich pastoral hinterland that became the Port Phillip District of New South Wales and later the colony of Victoria. The talk highlights La Trobe’s vision for the colony and the difficulties of administering the rapidly growing settlement and the unmanageable chaos following the gold discoveries. Daryl is a retired business executive. His great grandfather, Louis Ernest Leuba, one of the many Neuchâtel Swiss vignerons encouraged by CJ La Trobe to settle in Victoria, arrived in 1854. His other maternal great grandfather, Henri Frédéric Paris, also from Neuchâtel, settled in Melbourne in 1890. Daryl’s family associations with Neuchâtel, the Swiss home of Sophie La Trobe, triggered his well-developed interest in the ‘La Trobe era’ in Victoria. Contact Daryl for information and booking. The David Clark arrived on 29 October 1839, carrying with it the very first assisted immigrants direct to Melbourne. 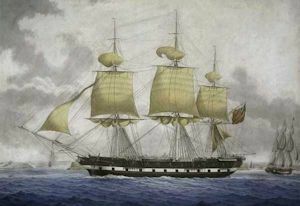 The talk describes the voyage and the arrival of the vessel, as well as its relationship with Charles Joseph La Trobe who developed contacts with many passengers aboard David Clark. These included William and Agnes Bell of Yarra Glen, and plantsmen John Arthur and John McEwin, among others. Irene is deeply interested in many aspects of Victoria’s history and has worked extensively as a volunteer with Public Records Office Victoria (PROV) archives. As a member of the La Trobe Society, she participated in the PROV project of indexing the Inward Correspondence to La Trobe, 1839-1851. She also carries out research for the National Trust on topics relating to public art to be registered. Contact Irene for information and booking. To book a group tour to La Trobe’s Cottage, please phone 9656 9804 or email bookings@nattrust.com.au. See also Events that you may attend.